As the CTD rises out of the water, we line up in the hallway, donning life jackets and ensuring all of our bottles are properly labeled and ready for samples. We watch Lead Marine Technician Leighton Rolley secure the CTD and wait for the signal that it is safe for us to enter the starboard bay. Standing there in anticipation—ready to perform our well-rehearsed routine of collecting water—reminds me of being backstage at a dance recital. I know everything is going to turn out fine because we have done it so many times, but I still get butterflies. 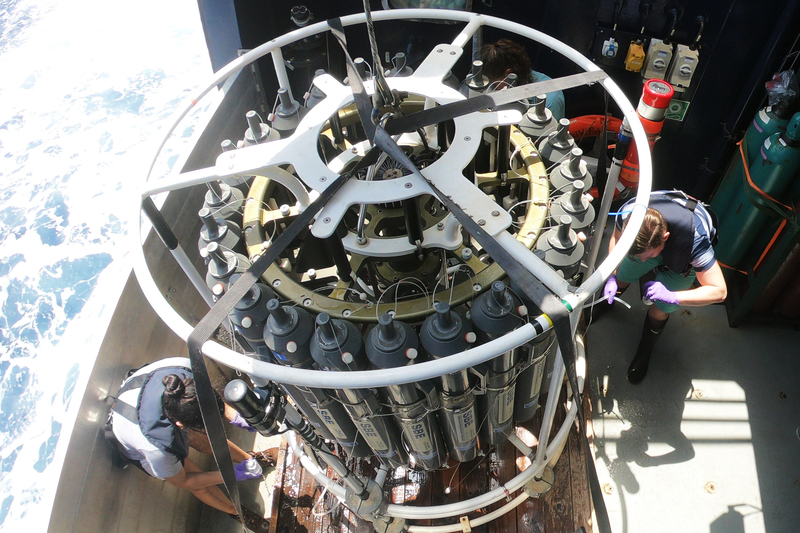 The CTD allows us to look at the chemistry and physics of the ocean with little perturbation from the atmosphere. The standard design, referred to as a “rosette,” includes a large circle of twenty-four twelve-liter (three gallon) Niskin bottles. These open-ended cylinders are made of hard plastic and have two caps connected by a spring. When the CTD enters the water, all the caps are open. We send it to deepest depth we want to sample before hauling it back up. As it ascends, the CTD stops for a few minutes at designated depths and an electronic signal snaps particular Niskin bottles shut. By the time all the bottles are filled with sea water, the CTD weighs over 1,500 pounds. On this expedition, we have utilized both this standard CTD set-up as well as a modified version that incorporates our in-situ incubators. Instead of a typical CTD cast (where the instrumentation goes down and immediately comes back to the surface), we sent this specialized set-up to a particular depth for as long as 18 hours. This allowed us to incubate sea water in its natural conditions, while simultaneously collecting water for our shipboard experiments. When the CTD is back on deck, it is time for us to get to work. As we hop from one Niskin nozzle to the next – tubes in hand ready to get our samples – we look like Maple tree tappers in February: just as they try to save every drop of Maple sap, we are careful not to lose our sea water as it furiously rushes from the nozzle. As we bottle the water, we follow a particular order to ensure the samples most sensitive to atmospheric contamination are collected first. This means we collect the pH and gas samples first before moving onto other parameters. 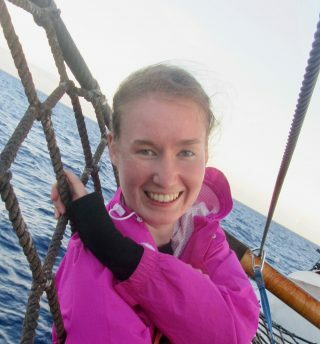 Because we have such a diverse team with individual scientists interested in different aspects of microbial activity deep in the ocean, careful planning is required to allocate water. Whole Niskin bottles are reserved for onboard experiments that complement the in-situ incubators. 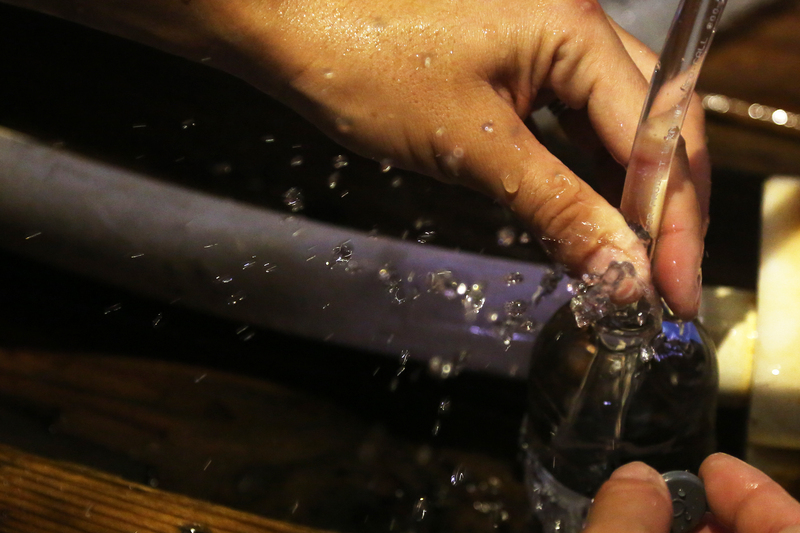 In this way, we utilize every drop of water we pull up from the ocean’s depths. I watched the Falkor’s first CTD deployment from the Science Control Room, a red-lit area with one wall completely covered in monitors. Once the CTD hit the water I saw graphs of different metrics detailing this part of the ocean update right before my eyes. After learning about oceanography in a traditional classroom setting, it was remarkable to see these abstract data come to life on the monitor in real time. Later today we will send the CTD to its deepest depth yet: 4,000 meters, or roughly two and a half miles. Thinking about the physics and chemistry that far down in the ocean is difficult to wrap my head around, but in just a few hours, I will be holding this near-freezing water in my hands. 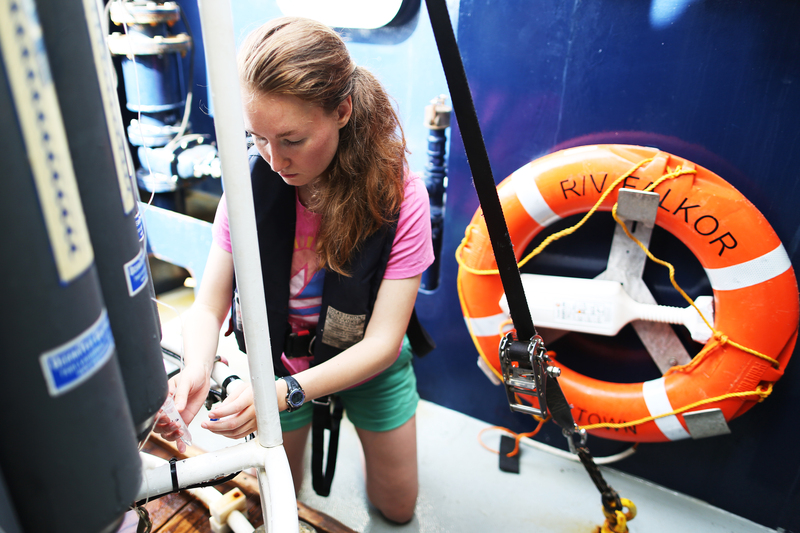 Nicole Travis collects a water sample from the CTD.